Holding your iPhone horizontally will help you control Phil better. You can comfortably place both thumbs on the arrows placed on the left and right side of the screen. Playing the game on portrait mode will make it very difficult to ride as the controls are placed too close to each other. A much better option would be to play this game on an iPad. First-person mode will let you know exactly how far you are from the obstacle. 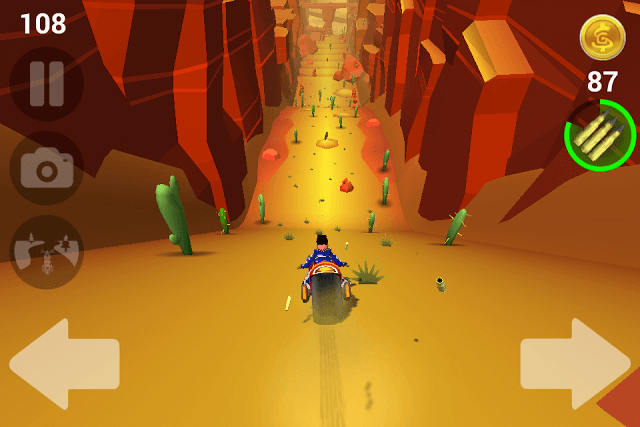 Riding the bike on the treacherous road full of desert cacti is hard and you will need some practice whether you are riding in first-person or third-person mode. But with the first-person mode turned on, you will only have to focus on what’s in front of you, so there’s less distraction. Other players may differ from my opinion, but I found riding the bike in first-person better third-person mode. I could ride longer and with a little more practice you can easily surpass the points earned while riding in third-person mode. To change to first-person perspective, tap the button underneath the camera icon on the left side of the screen. Buttons appear when you start playing the game. Special bikes are armed with shields and guns. You will need to pay money to own them. However, you can test ride them for free. Go to the Bikes section and tap “Special”. Next tap the play button next to “Test Drive!” You will have to watch a short advert before you can start test riding a special bike. You will be given 3 chances, so make the most of the test drive phase and collect coins/earn points. Note: Purchasing any one bike removes ads. The Infinity Special Bike starts with guns. When you test ride it, the guns timer shows how long the bike will shoot bullets. The Reynolds starts with a shield, which will remain for a few seconds before vanishing. You can also test premium bikes. Under this section, you will find some amazing dirt bikes. You can also get some off-road motorcycles for free. When the game ends, tap “Win a Prize” and then select the bike option. Who knows you may get one. Pssst…I got The Roczen free. Sometimes, you may find a Gun or shield offer on the game over screen. Watch a 30 second video to get them for free. Guns can destroy obstacles except rocks and shield will protect your bike from bumps against rocks and desert cacti. However, both these power-ups last for a few seconds and may vanish even before Phil is on the middle of his bike adventure. Chances of getting out of control are more if you long press the left or right arrow button on the screen. Phil will make a sharp turn, almost drifting his bike and dash against an obstacle. Using short taps will help you control Phil better. When the game starts, the road is pretty safe and you will find few obstacles. But once you get past the first coin, the road’s full of cacti and rocks. This is where you should drive carefully and short taps are a much better option to get out of the way of obstacles on the road.